We report whole-rock major, trace, mineral, and isotope chemistries of the Jacaré dos Homens, and Santo Antonio granitic rocks from the Águas Belas–Canindé batholith, Pernambuco–Alagoas Domain of the Borborema Province, northeastern Brazil. These rocks exhibit low-angle foliation, suggesting emplacement under a regional strain field, associated with transpressive deformation tied to the onset of the Brasiliano orogeny. Both rocks are dominantly made up of K-feldspar, quartz, and plagioclase with biotite as the main mafic phase and minor hornblende. The Jacaré dos Homens orthogneiss displays magnesian, slightly peraluminous, and alkali-calcic character, while the Santo Antonio granite is magnesian, metaluminous to slightly moderately peraluminous and alkali-calcic to alkalic. These granitic rocks are enriched in alkalis (up to 10.28 wt%), mg#, Rb, Ba, Sr, Th, and LREE, and depleted in HREE and HFSE, with distinct Nb, Ta, and Ti depletion. Decreasing MgO, CaO, TiO2, Na2O, Fe2O3T, P2O5, Al2O3, Sr, Zr, and Hf with increasing SiO2 are consistent with fractional crystallization of biotite, amphibole, plagioclase, apatite, zircon, titanite, and Fe–Ti oxides. U–Pb zircon dating of the Jacaré dos Homens and Santo Antonio rocks yielded concordia ages of 642.4 ± 3 Ma and 636 ± 4 Ma, respectively. The isotope data for the Jacaré dos Homens orthogneiss yielded an Nd-model age of 1.21 Ga with slightly negative εNd(642 Ma) of − 1.58, initial 87Sr/86Sr ratios of 0.7068, and δ18O (zircon) value of + 7.0‰ VSMOW. The isotope data for Santo Antonio pluton yielded Nd-model ages between 0.96 and 1.07 Ga, with εNd(636 Ma) from + 1.17 to − 0.67, initial 87Sr/86Sr ratios from 0.7048 to 0.7056, and δ18O (zircon) value of + 5.0 to 5.9‰ VSMOW. Altogether, the petrological, geochemical, and isotopic data are typical of I-type granites. 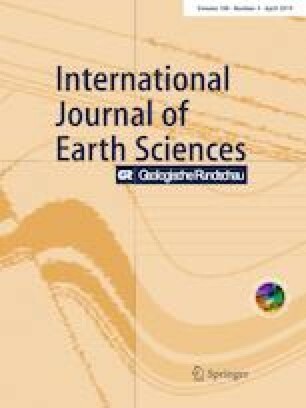 We propose that the studied granitic rocks were derived from mantle-derived medium- to high-K basaltic lower crust of Stenian/Tonian (Jacaré dos Homens) or Tonian (Santo Antonio) ages and that partial melting was triggered by the uplift of asthenosphere and underplating of lithospheric mantle. The migration and buoyancy-driven ascent of the magma to their present level were probably favored by the Jacaré dos Homens shear zone. We are highly thankful to Prof. Wolf-Christian Dullo, Editor-in-Chief, and Prof. Marlina Elburg, Subject editor, for comments and careful editorial handling, and to Prof. Silvio Vlach, Prof. Leonardo Gonçalves, and Prof. Frederico Vilalva for their critically constructive reviews, which allowed us to improve the present discussion greatly. We also express our gratitude to Prof. Leon Long and Prof. Michael Roden for their critical reading and polishing of an early version of this manuscript. We are indebted to Prof. José Maurício Rangel da Silva for geological discussions in the field. TRS thanks M. L. da Silva Rosa, J. C. Mendes, A. F. da Silva Filho, and A. L. Bertotti for discussions. Thanks are also due to Gilsa M. Santana and Vilma Sobral Bezerra for the assistance with oxygen isotope analyses, Severina Paulina for assistance with chemical analyses at the Stable Isotope Laboratory (LABISE) in the Federal University of Pernambuco, Brazil, and Bruna Maria Borba de Carvalho for mineral analyses at the Electron Microprobe Laboratory in the University of Brasília, Brazil. TRS and MMCL are especially grateful to Kei Sato for the help and guidance with the U–Pb analysis on the SHRIMP IIe at the University of São Paulo, Brazil. VPF and ANS acknowledge the continuous financial support from the CNPq and FACEPE through several grants (PRONEX/FACEPE APQ-0479-1.07/06, APQ-0727-1.07/08, APQ-1738-1.07/12 and CNPq 478554/2009-5, 472842/2010-2, 471034/2012-6). This is the NEG-LABISE contribution n. 285.